As a white male, I take Lemon’s statement personally. In one sentence, he says we “have to stop demonizing people” and then goes on to spew the most ignorant, racist demonization of a class of people. And what, perchance, is he thinking when he ominously states that “we have to start doing something about them?” Re-education concentration camps? Frontal lobotomies? Social isolation – the latter of which Lemon may recall as segregation. His condemnatory racist language does not only make Lemon hateful, it makes him downright dishonest. Is his mind so addled with racial venom that he is intellectually incapable of comprehending the illogical juxtaposition of his own statement? 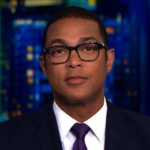 Now, Don Lemon happens to be black, and this brings up another point. If I, as a white man, said this about black people, I would be villified and probably murdered, especially in the press … not given my own TV show. How is it that no one sees this double standard? Don’t believe me? Check out The Washington Post where he stands by this egregious claim!